US Federal Reserve kept interest rates unchanged but said inflation would likely rise in 2018, due to declining unemployment, higher business and personal spending. US 10 year bond yields rose to 2.7% near its highest level since 2014 on concerns over the rate outlook. 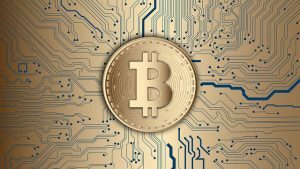 Bitcoin and other crypto currencies fell in response to regulatory clampdowns/ bans in South Korea. There are concerns over liquidity should the sell-off persist. City Developments failed to buy Millennium & Copthorne Hotels reaching a 47% acceptance rate. CMA reported that it still had plurality concerns over the acquisition of Sky by Fox. However investors took comfort in the proposed remedies and the acquisition appears on track. Esure CEO departed to make way for an expanded role for majority shareholder Sir Peter Wood. Carillion went into liquidation, after failing to secure further loans. Carillion held £29m cash but outstanding debt and creditors above £1.5bn. Capita will undertake a £700m rights issue and further asset sales. The new CEO said Capita must get the balance sheet right and lower both its £1.1bn debt load and pension deficit. UK blue chips put in a cautious performance over January 2018, weighed down by UK specific issues. Dignity, the only listed funeral operator, reported that it would cut prices and invest in its online offering. Its shares collapsed 50% as forward estimates circulated estimating an EPS decline of c. 50%. 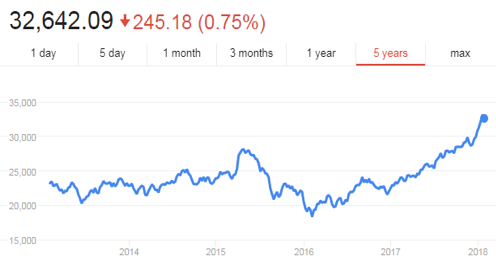 Carillion’s collapse has brought calls for a re-assessment of pension regulation and oversight, and the practice of companies putting off the tough decisions on pension deficit funding. The PM is likely to address the corporate governance and pension issues with reforms likely over 2018/2019. It is possible new powers will be created enabling the Pensions regulator to demand companies address their pension deficits. The outsourcing sector was also rocked by Capita’s move to address its balance sheet via a £700m rights issue and cancel its dividend. The firm also warned on profits following the loss of a lucrative contract with Prudential. Easyjet reported 14.4% revenue growth to £1.14bn helped by a 6.6% increase in revenue per seat. This allayed concerns, that fleet growth would depress prices. Next benefited from the rise in sterling against many major currencies, the group sources its product abroad. China is probing “fake data” at the provincial level after a new data analysis from Bloomberg showed Chinese provinces overstated its GDP consistently between 2011 and 2015. If electricity demand is used as a proxy for actual economic growth then the difference between provincial growth and the official growth rate can vary between 1.2% and 3.1% between 2011 and 2015. The run-away Hang Sang index lifted another 7.77% during January 2018 adding to its 35% gains over 2017. The index P/E hit 15x with a 2.6% dividend yield. The move up has been helped by surging bank, insurance and local property stocks. Europe is picking up speed with GDP growth accelerating over 2017. This is despite the headwind of a strong Euro impacting demand for EU exports. Poland, an export economy whose trading partners are mainly EU countries is saw GDP growth of 4.6% a sharp increase on the 2.9% growth in 2016. 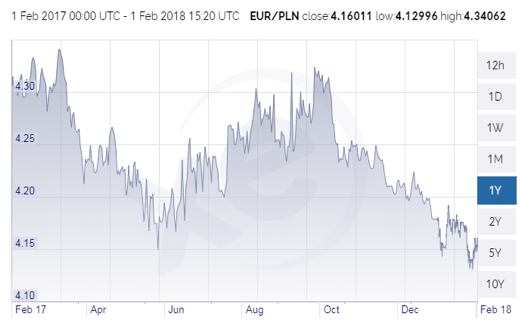 At the moment the Zloty looks like a firm bet, as its 1.5% interest rate is forecast to rise to 2.5% by mid2018. Germany is also experiencing near booming conditions with GDP growth at its highest since 2011 and unemployment at its lowest in 27 years. The budget is in surplus with the debt to GDP ratio declining to 60% for the first time since 2003. Investors digesting US President Donald Trump’s State of the Union for clues about 2018 were left with a recitation of 2017 “achievements” and a “massive infrastructure” bill. Will this be enough to support US equity valuations now that the corporate tax cut to 21% is history and has been priced in? During January the US dollar fell sharply against leading currencies as investors suspected the US Treasury Secretary, Steven Mnuchin was encouraging a soft dollar. At the Davos World Economic Forum Mnuchin said “a weaker dollar is good from trade”. Arguably the concern is deficit swelling spending plans are dislocating bond markets and driving up inflation. The 10 year bond yield has jumped from 2.46% to 2.72% over January, the biggest monthly move since November 2016. Expectations for the US Federal funds rate centre on three 0.25% hikes over 2018. US equities are undeniably in overdrive with another 5.3% jump in January after a 25% gain in 2017. 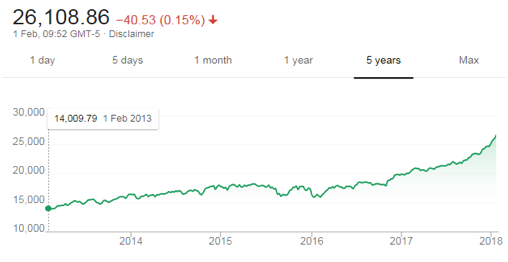 The Dow has added 12,100 points over the last 5 years.